Attend any national or regional nutrition conference or event, and you'll continue to notice that the dietetics field is full of passionate and dedicated nutrition professionals who genuinely care about making a difference in people's lives. RDs work in various capacities, wear several hats, and play many distinct roles in corporations, foodservice institutions, private practice, media, academia, research, and public health, and are making an impact across the country and around the globe. While there are countless dietitians making a difference, there are some who go far beyond the call of duty and deserve recognition for the extraordinary influence they have in the profession. That's why each year Today's Dietitian (TD) invites readers to nominate their especially dedicated colleagues whom they believe are doing outstanding work in dietetics. In honor of National Nutrition Month® and Registered Dietitian Nutritionist Day, TD has chosen 10 RDs who deserve kudos for the exceptional work they do. 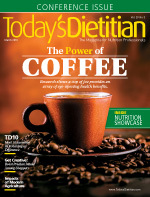 These 10 dietitians are making great strides in various areas in the nutrition field. Although they all have taken different career paths, they share one important thing in common—a desire to do whatever it takes to improve the health and wellness of others. We hope you'll enjoy reading about their stories as much as we did and continue your work to make an extraordinary difference in the profession. To say that Denine Rogers' days are busy would be an understatement. In addition to working full time as a telemedicine nutritional consultant for Anthem (Blue Cross Blue Shield), the "odd hours" of that role enable her to also run her private practice—Living Healthy, an integrative functional nutritional medicine practice in Georgia—and work part-time as an integrative functional dietitian preceptor for Life University in Marietta, Georgia. As if that's not enough, Rogers finds time to hold various leadership roles such as cochair of the Anthem e-Commerce Committee of the African American Professional Exchange, an alumni ambassador for American College of Healthcare Sciences, and a member and part of the executive committee for some of the Academy of Nutrition and Dietetics' (the Academy) dietetic practice groups and member interest groups. Rogers also works as a consultant in various capacities, has been a contributing writer for the Academy's Stone Soup blog, and even serves as a volunteer master gardener in the State of Georgia, a position through which she's been able to work with and teach about herbs, essential oils, gardening, and nutrition to the Douglas County of Georgia local communities, schools, and social and civic groups. Rogers is also committed to bringing more diversity to the field of dietetics. "It's a goal of the Academy to bring in more people of different backgrounds, and I'm proud to be part of that effort," says Rogers, who's also an active member of the diversity committee for the Georgia Academy of Nutrition and Dietetics and an active member of the Academy's Asian Indians in Nutrition and Dietetics Member Interest Group. "I enjoy speaking to students about what I do as a dietitian and why this might be a role they'd like to consider for their own future." If there could possibly be a "silver lining" to a cancer diagnosis, Nathan Schober says he has found it. As an oncology dietitian diagnosed with cancer himself, he has the unique ability to relate to his patients on a much more intimate level. Schober, who has been battling Hodgkin's lymphoma since February 2017, has experienced surgery, radiation, chemotherapy, and at press time was going through stem cell transplantation. He says his passion for his patients—and "a therapeutic amount of coffee"—helps keep him going even on the toughest days. Schober understands what his patients go through—taste changes, nausea, fatigue, weight loss, and painful swallowing—and he shares his own story when the situation warrants. He recalls a head-and-neck cancer patient who required major surgery and a feeding tube and was struggling to cope. The patient had refused to hear anything about the tube fitting until Schober stepped in and shared his own cancer story. Today, whenever the two see each other, the patient recalls how it was Schober who inspired him to fight. And that's what Schober says he loves most about working with this patient population: They're "fighters." "These are people that are fighting the hardest battle of their lives," Schober says. "But they're a highly motivated patient population, and that's inspiring." In addition to boosting patients' spirits daily, Schober also has been instrumental in executing new service lines at Cancer Treatment Centers of America at Southeastern, including working interdepartmentally to help implement use of SMOFlipid (a liquid emulsion used as a source of calories and essential fatty acids) for total parenteral nutrition patients, developing nutrition interventions for patients identified as having a moderate or severe risk of malnutrition, and collaborating with cardiopulmonary to implement a metabolic cart program for inpatients, in which calorie needs for feeding are determined by measuring oxygen intake and exhaled waste products. Schober says it's his goal to constantly gather new research and look for innovative solutions. Stephanie Perez's colleagues at ShopRite in Philadelphia call her an "amazing, visionary leader" and "incredible mentor." In just less than four years of serving as an in-store dietitian, Perez was promoted to the corporate office to lead, guide, train, and coach more than 100 RDs across 140 stores. What got her there? Her passion, insight, creativity, go-getter attitude, supportive nature, and ability to turn her many ideas into innovative programs that have bolstered the presence and value of in-store dietitians and educated and inspired shoppers to make better food choices and lead more healthful and productive lives. In her supervisor role, Perez takes charge of program creation and lesson planning for the stores' RDs and regularly travels to meet with them to lead, guide, direct, and improve their efforts to create unique health and wellness programs tailored to their shoppers' needs. "She understands the retail environment and acts as a champion for the other dietitians at store level," says one colleague. "Her contributions and oversight to our dietitian nutrition wellness program have made a huge impact on our ability to provide an enormous amount of free education to the communities we serve," says another. One program that stands out is a diabetes program Perez created while partnering with the pharmacy division. The program helps patients better understand diabetes as a disease, manage their blood sugar, eat more healthfully, and stay physically active. She provided all of the education materials and lesson plans for the dietitians to use at store level when counseling people with diabetes. According to Perez's colleagues, the program is having a positive impact on shoppers, who keep returning to the stores for additional advice and are making more healthful food choices while shopping. Perez says she always felt there was too much of a gap between the "doctor's office and the pantry." She always believed there needed to be a presence of dietitians at supermarkets. When she first began working at ShopRite, she conducted one-on-one nutrition counseling with shoppers, held cooking demonstrations, and created successful partnerships with the Children's Hospital of Philadelphia (CHOP), Head Start, and the American Heart Association. Perez partnered with a dietitian at CHOP for the hospital's annual Celiac Education Day for children and their families to spread the message about ShopRite's nutrition services. Perez took the CHOP RD around the store to show her budget-friendly gluten-free food options she could share with patients. Perez says she loves the fact that many doors have opened as a result of being a corporate dietitian. "I've learned business skills, had print interview opportunities, and have appeared on television," she says. "It's been a great opportunity." With a 96% growth rate of the Hispanic population in Delaware in just 10 years, Cheryl D. Bush decided to teach herself how to speak as much Spanish as possible to instruct members of this fast-growing population in her role as an extension agent. Community outreach is a key piece of Bush's role, and she's gone out of her way to tirelessly practice and learn phrases that help her teach a Spanish-language and culturally competent diabetes education program. Bush says that, as an extension agent, her job can be summed up as "meeting the local population's needs." But exactly what that means for her daily functions can differ dramatically from day to day. One day she might be gathering data to support programming, and another day she might be out teaching fifth graders at a local school on nutrition 101. Bush also works with many dietetics intern students at the University of Delaware. Bush is also responsible for coordinating the Extension's nutrition-, health-, and food safety-focused volunteers called master food educators (MFEs). She puts great effort into generating ideas for the bimonthly MFE advanced training meetings. Not only are the speakers she invites excellent presenters, the nutrition information is timely and applicable. Before working for the Cooperative Extension, Bush spent 10 years in home health care, where she says she developed a passion for serving. Bush says, "When I came to interview for this job, I asked if they needed a hardworking individual who was ready to serve and to help—and that's what I've tried to do ever since." Monique Richard has found many ways over the years to combine her two greatest passions—nutrition education and travel. Dietetics has taken her all over the world, and Richard says the opportunities have been eye opening. She's gone on two missions trips to Haiti as a volunteer to teach nutrition. She was the first dietitian to be part of the Azil Foundation, a small nonprofit organization mainly comprised of doctors and nurses that provides relief in Haiti. "This experience put nutrition in a different perspective for me," Richard says. "How do you practice when they have so little? It's going back to the basics. They have red beans and they have rice; now how can we get a little more fish into their diet? It's foundational nutrition." Richard also traveled to Egypt for a week, visiting an elementary school to teach school children about nutrition. And she had the opportunity to present research and travel to Beijing and Lanzhou, China, as well as Tel Aviv, Israel, to participate in the American Overseas Dietetic Association's Regional Conference on the Mediterranean Diet. She says her opportunities abroad have given her a chance to use her psychology minor and draw on her passion to empower people to improve their health. It was her own health issues that brought her to the field of dietetics in the first place. She was diagnosed with type 2 diabetes, but never once was she referred to a dietitian. However, research led her to realize nutrition can change her life—and it has in many ways. Today, Richard also works in two outpatient primary clinics full time and runs her own integrative and functional medicine private practice in her spare time. Director, Clinical Improvement, DaVita, Inc. In the renal dietetics community, Kathy Lahr is known as one of the most gifted tech-savvy dietitians. She laughs as she remembers when she started in the dietetics field using a typewriter. When her manager presented her with a computer for the first time, Lahr says it was a "pivotal moment" for her—and for her career. She learned the operating system MS-DOS and has come a long way since then. As a dietitian, her technological prowess has proved helpful in her ability to provide useful feedback to the IT department regarding DaVita's nutrition reports for patients. Her tech skills led to a technology role within the company. In 2010, she was promoted to director of clinical support technology for DaVita, a leadership role not traditionally offered to dietitians. In this role, she led a team consisting of nurses, dietitians, and social workers to provide guidance on clinical software development and increase efficiency for clinicians—leading to improved patient care. She also facilitated the development of an interactive web-based education program that adheres to motivational interviewing guidelines. Today, Lahr is the director of clinical improvement and provides leadership for the fluid management program for more than 2,400 DaVita dialysis centers nationwide. In this role, she has been instrumental in the development of a team approach as well as key resources that assist patients with fluid management. With fluid overload as a leading cause of hospitalizations for renal patients, Lahr's hard work and dedication is helping to keep these patients out of the hospital. "I have Crohn's and I know what it's like to be in the hospital," Lahr says. "I don't want my patients to wind up there when we can keep them healthy." Though she claims she doesn't look for crisis situations, Kelsey Sergison says they seem to keep finding her. As a traveling dietitian for Dietitians on Demand, Sergison has been confronted with two major emergencies—and she handled them with poise. In Northern California, Sergison worked 12-hour days for seven days straight covering the kitchen and clinical needs of a community hospital in a town where everyone had evacuated due to major flooding and fear of a flood dam breaking. She served meals and maintained her full patient load the entire time. A short time later, in Savannah, Georgia, when most people had been evacuated due to Hurricane Irma, Sergison stayed behind at a 500-bed hospital, volunteering to remain there overnight to allow the other local dietitians to go home and be with their families. Sergison says she had gone to both areas for ordinary staffing issues when a crisis broke out. "It just so happened that these natural disasters occurred while I was there," Sergison says. "It's taught me that I'm not afraid to step in—and step up—when needed." Sergison has traveled throughout California, New Mexico, and Georgia in the various short-term roles she's taken on as a traveling dietitian—typically because someone quit suddenly or went on maternity leave. Of the various roles she's played, she says the experience with Hurricane Irma certainly was the most intense. "Remaining calm—and keeping patients calm—when everyone is frantically evacuating was an experience I will never forget," Sergison says. "But these were patients who were too critical to be evacuated, and prioritizing their care came first." Lauren Jones and her team carried out a remarkable feat at Spring Creek Health Care. She played an instrumental role in creating and implementing programs to significantly reduce the prevalence of weight loss and promote successful wound healing, which brought the facility from a one-star to a five-star CMS rating. The Centers for Medicare & Medicaid Services rates nursing homes from one to five stars, with five stars meaning "above average quality" and one star meaning "much below average." For the facility, this was a complete turnaround. Jones says the biggest change involved taking a more hands-on approach and getting more closely involved in daily patient care. This included being involved in daily meetings with the nurses and staying more in touch with what's going on with the patient's total care. Jones says this more holistic approach has made a big impact on decreasing patient weight loss. Of course, if you ask Jones, she'll say she was "just doing her job." While there are certainly many criteria on which the CMS rating is based—everything from pressure ulcers to urinary tract infections and falls—wound care and weight loss are two big components, and Jones' team members say she's helped reduce the prevalence of these conditions to an "all-time low." Jones is known for her empathetic approach with patients. She spends more time with them than is required of her, sharing in their joys when they're happy and comforting them when they're going through a tough time. "I'm just passionate about what I do," Jones says. "And I have always felt that it was important to treat people the way I want to be treated." Jones insists that everything she does is just part of a team effort, but her team members know that Jones goes above and beyond. It's the same reason why patients will call her even after they've been discharged. She's someone who's truly making a difference. Understanding how important it is to build trust with the Native American populations Kristen Bradley works with, she's gone above and beyond to immerse herself in the communities and the cultures. This has involved attending, for example, sweat lodge ceremonies (a traditional ritual to give thanks, cleanse, heal, celebrate, or mourn) and participating in community events such as Indigenous Peoples' Day, part of the Roberto Garcia Spirit Run & Calling Back the Salmon Ceremony. Bradley says that being involved in these events has helped her reach some members of her patient populations on a more personal level. Chapa-De is a nonprofit community health center that serves Native Americans in California as well as low-income individuals and families. Bradley is a critical part of the diabetes team and is known as the resident expert on insulin pumps. With the general Native American population having a 15.9% diabetes rate—higher than any other demographic—Bradley says that reaching them on their level has been critical. Bradley was awarded the Starfish Award by PATHSTAR, a nonprofit organization whose mission is to inspire and revitalize sustainable health and well-being within Native American communities. Its most notable event is a weeklong educational and experiential San Francisco-based Alcatraz Swim Program in which participants swim from Alcatraz Island to San Francisco. Looking to meet her patients where they are (literally), Bradley jumped into the water even though she didn't know how to swim. She says many other participants didn't know how to swim, either, and felt it was important that she jump in like everyone else. "Sometimes you just have to step out of your comfort zone to really connect. It can be scary but worth it," Bradley says. In 2012, Laura Moore had a lofty vision to turn the University of Texas Health Science Center's dietetic internship program into something extraordinary. When she came on board as director of the dietetic internship program, she noticed the interns didn't have the resources they needed for hands-on learning and support during required rotations. With so many students vying for rotations, Moore wanted to do something that would make the training and skills of UT students the gold standard. What she did was spearhead the fundraising and development of the Nourish Program, which involved building a demonstration kitchen and holistic garden so students could learn how to cook and grow food and a simulation lab where students could walk through the steps hands on for optimal patient care. These additions completely transformed the program and the students' educational experience. While the primary use of the Nourish Program is dietetic student education, others have taken advantage of it as well. The Nourish Program offers Brown Bag nutrition education sessions to Texas Medical Center faculty, staff, and students, and provides culinary medicine courses for medical students. Nourish Program resources also have been used to develop community cooking classes for low-income families. In addition, the 5,000-square-foot garden isn't only a place to teach dietetic students where food comes from and practice seed-to-plate dietetics, but it also has become a focal point of the school in general and is used by other graduate students. Of seeing her vision come to fruition, Moore says that the resources provided through the Nourish Program are making a difference in preparing students for their future careers. She says, "I wanted to create the opportunity for our students to truly be the best and the brightest."